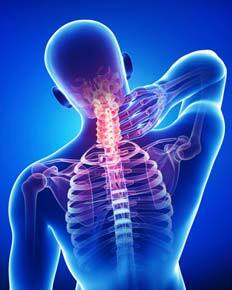 Neck pain is a common problem for many patients. The neck is made up of seven vertebra with attached muscles and ligaments, as well as the intervening intervertebral disc which cushions the spine, as well as facet joints. Problems with any of these structures can lead to neck pain. Most commonly, neck pain is self limiting, is related to transient muscle problems, often associated with overuse injuries, sports activities or trauma. Over time, our intervertebral discs and facet joints age and pain may be generated from these structures. Commonly, nonoperative care is the best treatment for these problems. You should see a physician immediately if you develop problems such as weakness or numbness, bowel or bladder disturbances, pain in the chest or left arm, failure to improve after three days of non operative care in cases of acute neck pain or chronic neck pain that has lasted more than six weeks.